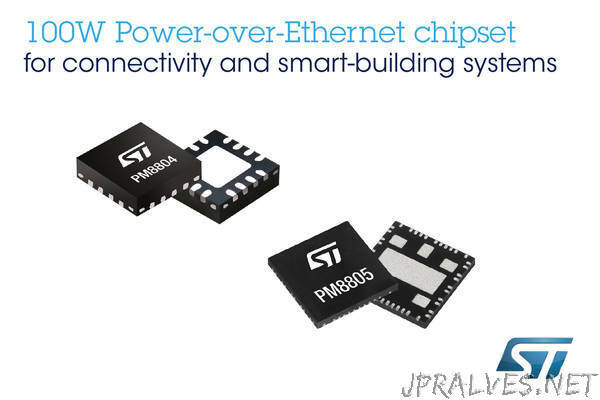 “A new chipset from STMicroelectronics lets users quickly build reliable and space-efficient Powered Devices (PDs) to take advantage of the latest IEEE 802.3bt Power-over-Ethernet (PoE) specification. The PM8804 and PM8805 provide the PoE-converter circuitry for PDs up to class-8, which defines a usable power budget of 71 Watts. The chipset saves space, enhances reliability, and cuts time to market for next-generation connectivity equipment including 5G “small cells,” WLAN access points, switches, and routers. ST’s new PoE chipset also targets smart-building and smart-office applications such as IP cameras, access-control systems, display panels, lighting, curtain or shutter controllers, video-call systems, IP phones, and tabletop consoles. The PM8805 companion chip contains two active bridges, a charge pump for driving high-side MOSFETs, a hot-swap FET, and the IEEE 802.3bt compliant interface. Integrating the active bridges saves the real-estate otherwise occupied by eight discrete MOSFETs and their driving circuitry. The PM8805 generates a Power-good signal for enabling the PM8804 and other circuitry such as an LED driver, and supports Maintain Power Signature (MPS) current control that allows the PD to enter power-saving standby without being disconnected.